In That's Not All Folks! we learn about the face and person behind Bugs Bunny, Daffy Duck, Porky Pig, and hundreds of other Looney Tunes voices - Mel Blanc . Mel Blanc (1908-1989) was a comedic genius who truly did work hard to secure himself a Hollywood career with his amazing talent. This biography is his story about who and what inspired his many voices, in addition to the steep ladder he had to to climb to fulfill his dreams. I know this sounds like the synopsis for any celebrity and their given biography, but given the time period, this story truly is inspiring. Two main components make That's Not All Folks extremely worthwhile. 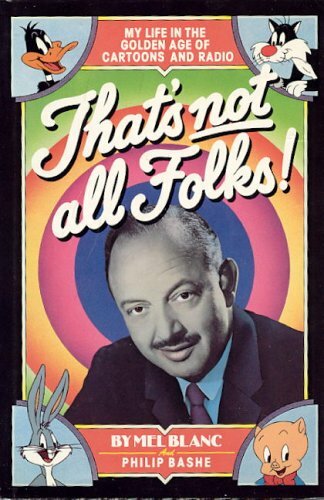 They are 1) The book's pictures and 2) Mel Blanc 's story of establishing his career. Mel Blanc is so charismatic and happy in all of the pictures, which tells me he loved his life and loved his work. I'm positive after reading his biography that he would have been one of my favorite comedians if I had lived within the time-frame he was at his best. 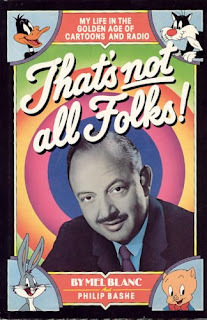 Career-wise, Mel Blanc did not get an easy Hollywood break. He starved, worked hard, and just kept on trying and trying to establish himself. I did find large chunks of the book a little boring; mainly because of the excessive name-dropping (which may have been his way of paying a tribute to those people) and minute details about some of the cartoon plots. Overall, I feel more wholesome having read That's Not All Folks and truly hope more people will have the opportunity to read this out-of-print title!